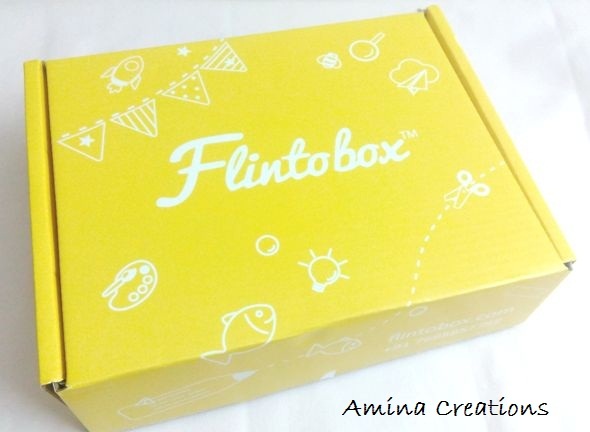 Flintobox is a subscription based activity box for kids based on their age. They come with a different and unique theme each month which help in the early development of kids in a fun, interesting and explorative way. It is crafted by montessorie experts and child psychologists and caters to 12 developmental areas of the child. These boxes can be subscribed just like a magazine subscription. I got an opportunity to review Flintobox which had insects as the theme for kids between 2 to 3. The box came neatly packed with 5 bags that contained various types of activity kits along with a small booklet on how to play. 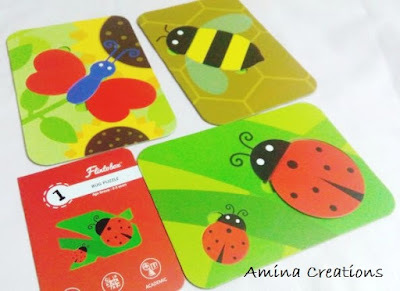 The first one was "bug puzzle" where the kids have to put the pieces together to form insects. 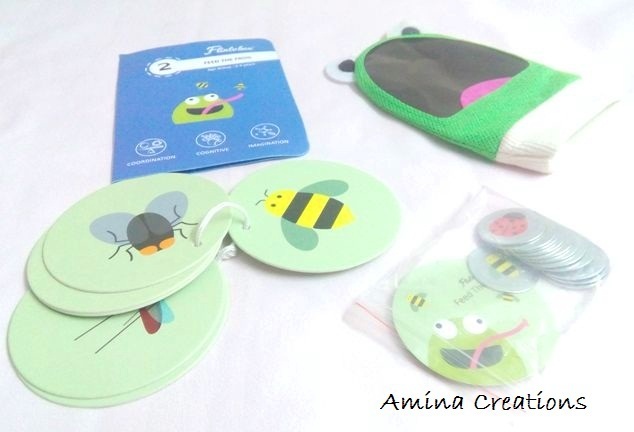 The next bag "Feed the frog" had a magnetic frog glove puppet along with a booklet of insects and insect tiles. We have to spread the insect tiles, call the insect from the booklet and our kids have to wear the glove and place on the correct insect tile which sticks to the glove. 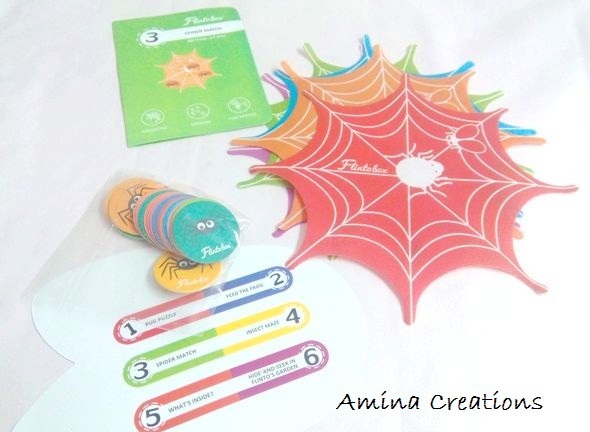 The "Spider match" has colourful spider webs which have to be matched with a spider card of the same colour. 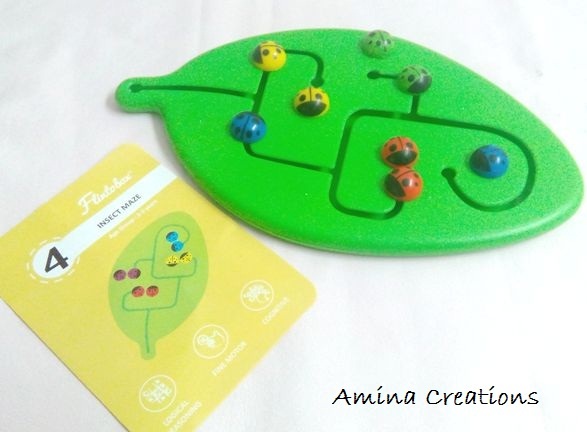 The next bag "insect maze" has a beautiful maze with ladybirds and the kids have to match two with the same colours. This is meant ot teach colours, reasoning, etc. The last bag "whats inside?" 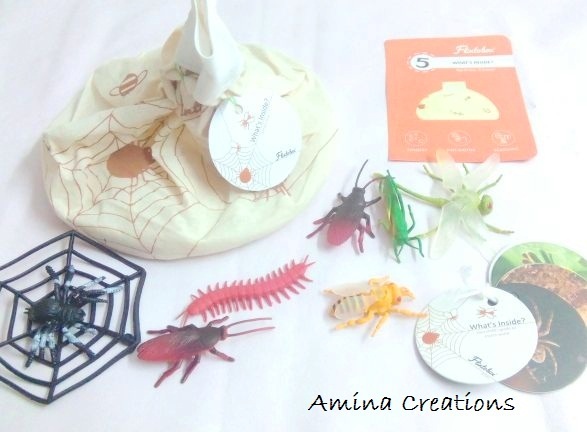 had real looking insects which can be put into the bag and the child has to identify the correct insects from the insects booklet. There was also a lift the flap book which would help our children in understanding the insect world better in a surprising and interesting way. All these activity kits would help kids in understanding shapes, colours, identifying insects, counting numbers and also help in their overall development. I took one bag at a time and played with my daughter. She was instantly hooked to it, made noises, jumped like a frog, matched shapes and colours and even fitted the puzzle correctly. 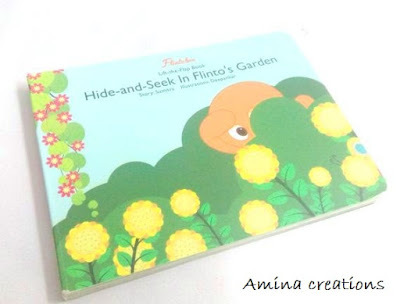 The main thing that would attract kids towards this box is that it is fun to play with and has beautiful colours and illustrations. For parents it is a breather as it would take our kids away from video games, smart phones and television and they would play and learn in a healthy way. If you liked my review of the flintobox and wish to subscribe to the box, you can visit the website here.